Happy Holidays Jim. Hope we communicate better in 2016 🙂 I think Oath cards could have value through their Standard life. There seems to be a malaise surrounding Magic at the moment, especially Standard. And this 2 Headed Giant angle of Oath could limit the desire for players to draft it and play sealed. Thus, it could result in an under-opened and less available Standard set (I’m thinking Eidolon of the Great Revel comparisons from Journey and Courser from BotG before he was reprinted, even Den Protector and Deathmist Raptor and all of DTK for that matter). So there might be some financial appeal and I think underproduced second sets will be where money in Standard could be made moving forward. Just my guess. Since you are also a player, what are you hoping for from Standard in this next set? 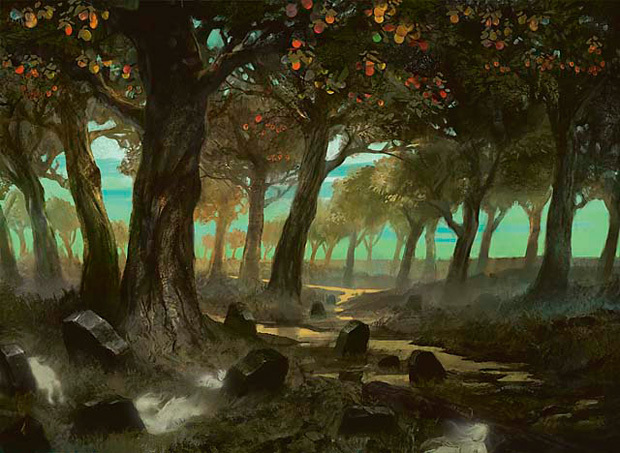 Do you have hope for Standard until Shadows over Innistrad? (not all players I know do and are waiting for the fetches to rotate out of Standard before rejoining. 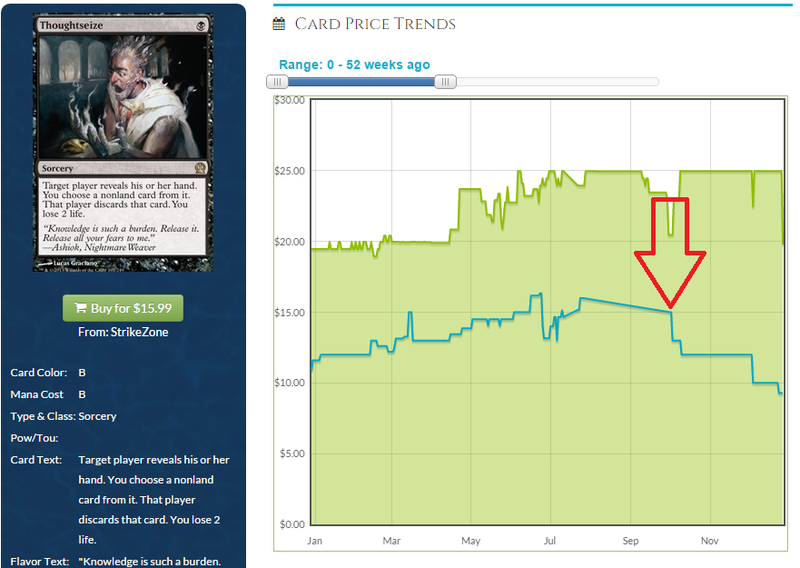 Well the game play, continued prevalence of Siege Rhino, and $60-80 Jaces are holding many back in my area). It’s very early in the spoiler season, and that surge goblin should help push aggro red decks and make them closer to tier 1, but is there anything you see or think we’ll see that will positively change up Standard a bit? It’s really hard for a set to be “under produced” nowadays because stores just buy so much product because they know they can sell it eventually. I don’t think there will be many financial opportunities outside of the summer and spring sets. Atarka red is a tier 1 deck and most of it survived rotation so I’m not entirely sure the new bushwacker solves any new problems for it. 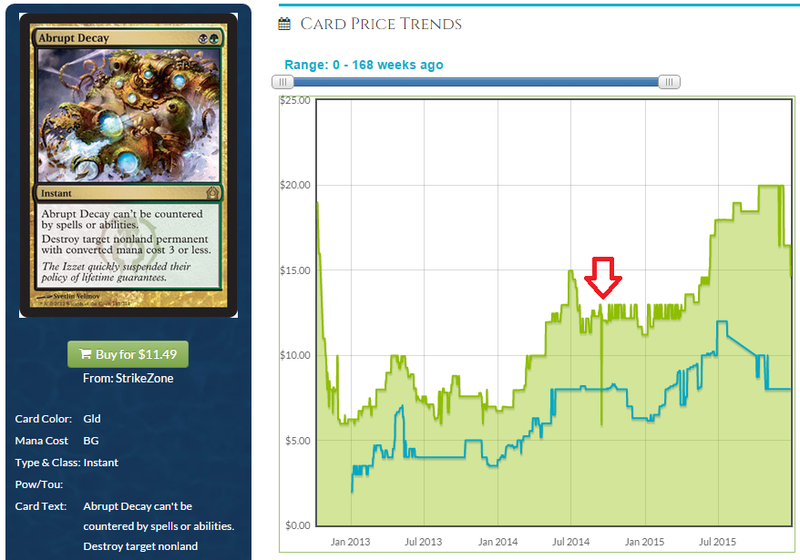 Siege rhino rotates with become immense and temur battle rage so we’re basically at parity again after SOI. I think the issue isn’t the number of playable decks but the play style that people may be tired of. But I’m not really sure SOI can solve that problem. If the eldrazi deck continues to get better it may become the abzan deck of the next year or so. I wanted to ask about the comment about magic’s playerbase not growing, where did you get that from? Is there data available on that topic? It’s all based in inferring other data points. 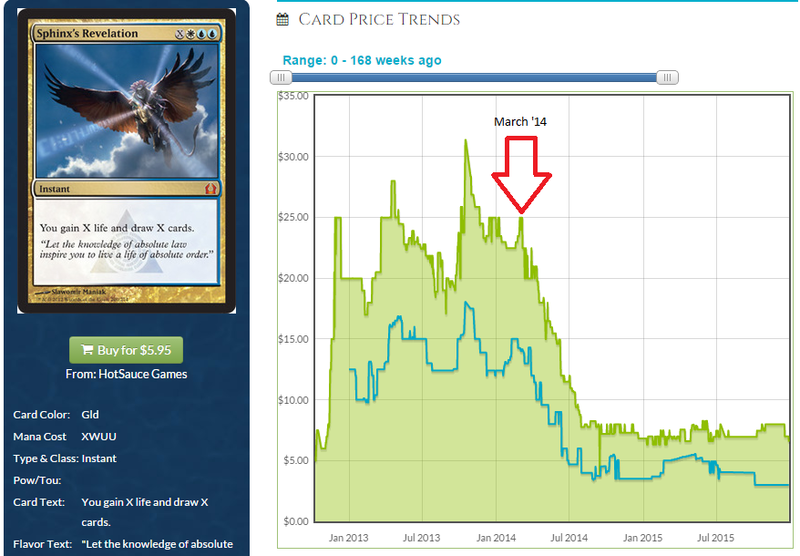 For example, WOTC previously touted it’s year over year player growth but did not mention it this year. The decrease in scg opens and gps suggest that there are just less players to play in them making them not worth holding. Hasbro complaining they are losing money due to the exchange rates suggests that the United States is not picking up as much of the profit as it previously did. 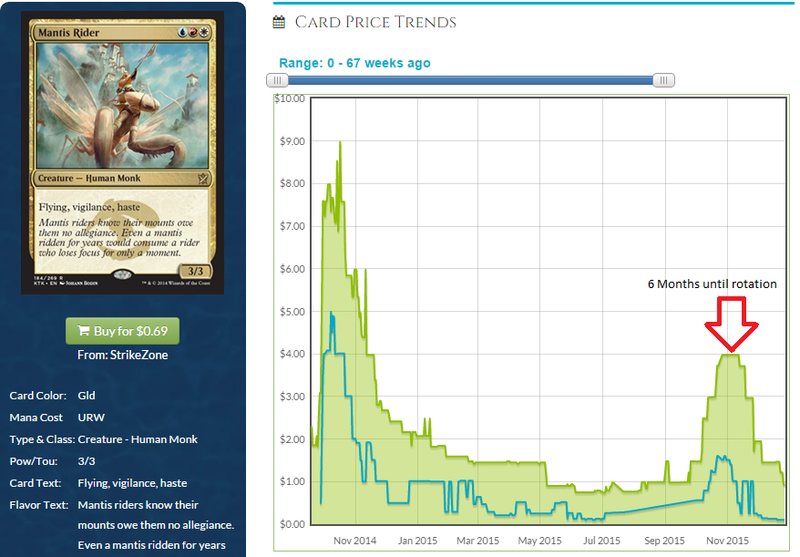 And then the trends of KTK singles suggests that the supply of opened KTK was enough for the player base a year later since nothing really went up and held a new price. 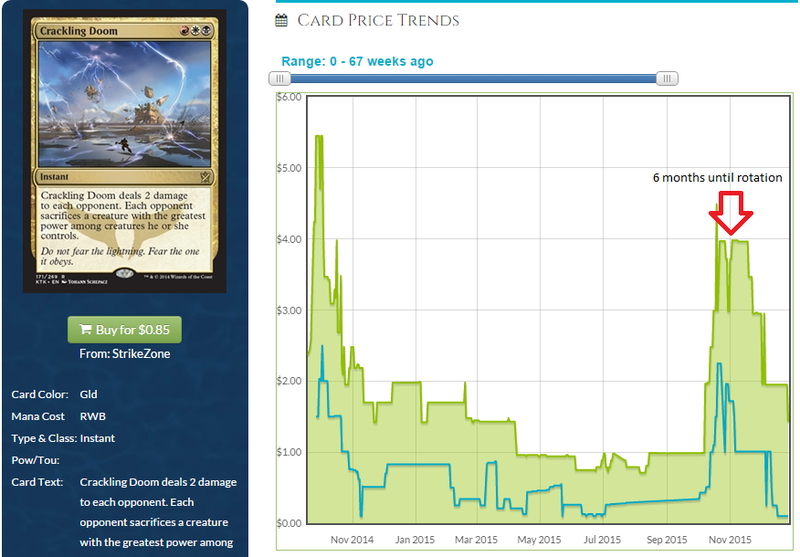 That’s in stark contrast to Theros block where several cards increased in value after the RTR rotation.